This year we are delighted to celebrate 40 years of IVF, with over 250,000 children now successfully conceived in the UK. Each and every day, families across the country celebrate this miraculous chance to start a family. But for some women, this life-changing opportunity comes with life-changing consequences. For some women, no provision for their welfare is made under law. And for some women, such consequences can prove fatal. Siobhain was staggered to learn that one third of women undergoing IVF suffer the completely avoidable Ovarian Hyper Stimulation Syndrome, with occurrences marked from moderate to severe for 3-8% of these women. What’s more, this is believed to lead to a shocking 3 deaths every 100,000 cycles. And so, in light of the overwhelming evidence that drug protocols can cause women such extremely adverse health effects, she has brought a Bill to Parliament to call for the outdated Human Fertilisation and Embryology Act to be amended to make essential provision for the welfare of women. Because of the absence of the welfare of women in the Act, the Human Fertilisation and Embryology Authority is unable to monitor or regulate guidelines on clinical practices relating to the administration of drugs and dosages during IVF. This is particularly concerning considering the evidence that collecting more than 15 eggs during IVF brings a significant risk of OHSS. And yet, in 2012, the HFEA recorded that over 3,400 women had more than 20 eggs collected! Furthermore, clinics are required to report cases of severe OHSS occurring as a result of treatment in their clinic to the HFEA, but there is powerful evidence that wholesale under-reporting occurs. 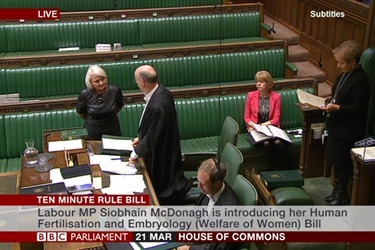 If Siobhain’s Bill is to become law, there is an array of Parliamentary hurdles that it must pass, with the next stage being a reading in the House of Commons in the Autumn. We have a duty to ensure that IVF continues to enable the celebration of new life, but that this is not at the expense of the women who are undergoing it. 26 long years since the Human Fertilisation and Embryology Act was created, it’s high time that it’s inadequacies are reformed and the welfare of women is recognised.